Godaddy is a popular domain hosting company, which is known to release offers frequently to acquire new customers. $1 hosting per month can be said to be the best offer given by Godaddy for it’s users.The best thing about this coupon is it is not limited to new users, you can use this coupon n number of times. This coupon is available for economy hosting plan, which is a decent hosting package. You can check out the details of this hosting plan below. 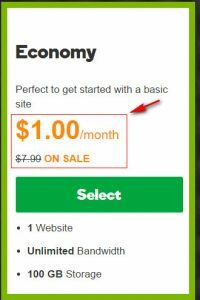 From the above screen shot you can see that Economy hosting plan of Godaddy costs $3.99/month with 50% off. But if you look closely you can also see that while renewing you have to pay $7.99/month. 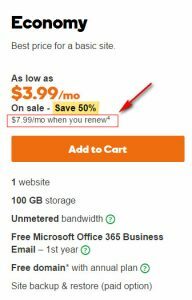 Now comes the best part, by using this $1/month Godaddy Hosting Coupon you will be able to buy 12 month’s economy plan hosting worth $95.88 ($7.99 * 12) for just $12. The offer doesnot stops here you will also be getting a free domain name. Let’s assume you want to buy a “.com” domain name and a hosting plan for 12 months. You can see that you will be able to save $94.87 using this coupon. Now that we have talked a lot about the benefits let us see what you get for $12. The only negative point which we can say about this hosting plan is you can host only a single website with this plan. Ignoring that, the user will be getting an unlimited bandwith with 100GB storage. 100GB storage is more than enough for a single website, unless your website is a wallpaper website. Godaddy is a world-renowned hosting provider with data centres all over the globe. 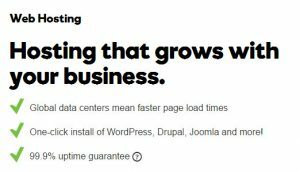 Not only that, Godaddy also guarantees a 99.9% uptime for the websites they host.